We have seen in our industry a high demand for Torlon. The material's great performance under stress and it's versatility are just a few reasons why many companies rely on it. 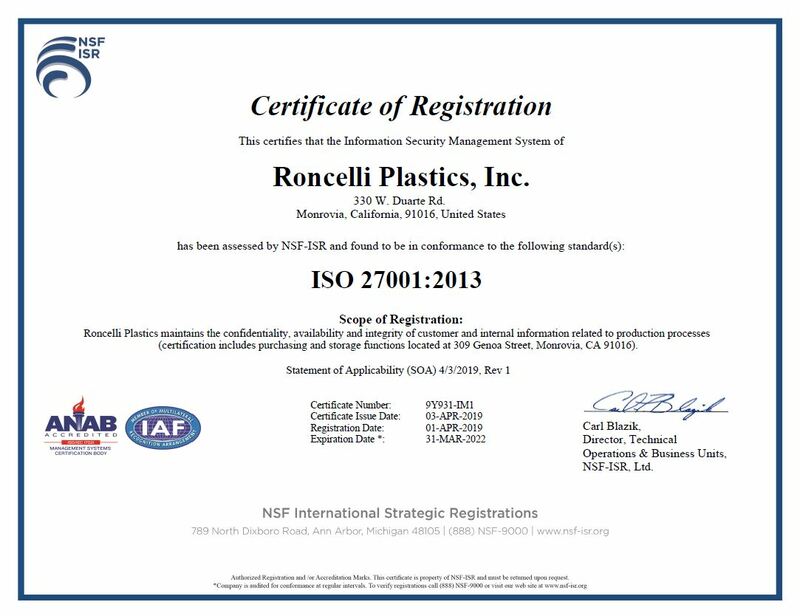 We are pleased to announce, Roncelli Plastics has received ISO 27001 information security registration from NSF-ISR. This multipart series starting with Part 1 compares two methods; Heat Deflection Temperature vs. Dynamic Mechanical Analysis curve used to test temperature on plastics, and which one is the better solution. Looking for innovative plastic solutions for your next complex project? Interested in hearing about how plastic can replace metals and the durability of the material? Come see Roncelli Plastics at the MRO Americas show, we'll be at booth 4648. Roncelli Plastics' outside sales team is growing. We would like to introduce Rebecca Reidy who has been in the plastics industry for 5 years and ready to grow business for Roncelli Plastics in Texas. This business development pro, who started recently, has exceptional relationship building skills, is team focused and possesses a “go-getter” mentality. Rebecca’s close colleagues say she’s a hard worker and works very well with others. We are pleased to announce our newest team member Terry Tewell to our Business Development group. Terry brings over 35 years of experience in plastics distribution and fabrication. When asked what he attributes his career success to, Terry said it’s his passion, drive for the industry and great mentors. Terry will work with customers to develop and improve customer’s applications i.e. : material selections and manufacturability. We will provide in-depth technical support to our customers. Welcome aboard Terry! If you want to find out more click here. Looking to partner with a precision plastics manufacturer who has game changing technology now and into the future?